Emily Hayward and AP Ninja in the Premier League Horse Grand Prix at the Fiber Fresh Feeds Premier Showjumping Show at Woodhill Sands. A change in gear has proved just the ticket for Te Awamutu teen Emily Hayward and AP Ninja who took the top honours in the Premier League Horse Grand Prix at the Fiber Fresh Feeds Premier Showjumping Show at Woodhill Sands today (Sunday). Emily has switched Ninja to a hackamore and the pair got plenty of comments about the sometimes-fiery pony’s calmer behavior. They were one of just two combinations from the original nine starters to go through to the jump-off over the Philippa Howells-designed course. Emily and Ninja were double clear in 45.84 seconds, with second-placed Daniel Blundell (Auckland) and Athena NZPH picking up eight faults in their 49.58-second round. “I am really pleased,” said Emily who doesn’t like to give her horses massive breaks over the winter months, but in the same breath is always careful about when and where she starts her team. She spent the winter working on her father’s dairy farm where she will continue part time while campaigning her crew, including Yandoo Lay Gold, Belischi HM and a couple of youngsters who are yet to make their debuts in the ring. Next up is Equidays, followed by Hawke’s Bay and Masterton – with a focus on the latter two. “Hawke’s Bay and Masterton are my priority, so I didn’t want to push it too much today.” However, Ninja loves a good jump-off and always gives it his all. In the Country TV Pony Grand Prix Emma Watson (Morrinsville) fairly flew home with her gorgeous Maddox Fun House. Just she and Sophia Hall (Karaka) aboard TCG Centadel came through to the jump-off and while both picked up four faults, Emma was nearly 10 seconds faster than Sophia. The show attracted almost 300 horses and was held in near perfect weather. Philippa Howells built in ring one, Danielle Watts in ring two and Wayne Bragg in ring three. Fiber Fresh Feeds Premier League Horse Grand Prix Series: Emily Hayward (Te Awamutu) AP Ninja 1, Daniel Blundell (Auckland) Athena NZPH 2, Elmo Jackson (Auckland) Fairview Animation 3, Oliver Croucher (Rotorua) Waitangi Wi Fi 4, Alexa Randall (Auckland) LC Tango 5, Brayden Aarts (Pukekawa) LT Holst Aunty Annette 6. Country TV Equissage Premier League Pony Grand Prix Series: Emma Watson (Morrinsville) Maddox Fun House 1, Sophia Hall (Karaka) TCG Centadel 2, Georgia Bouzaid (Waiheke Island) Redcliffs Bill 3, Madison Jackson (Pukekohe) Showtym Endeavour 4, Maddison Greatorex (Waipu) Spotified 6. 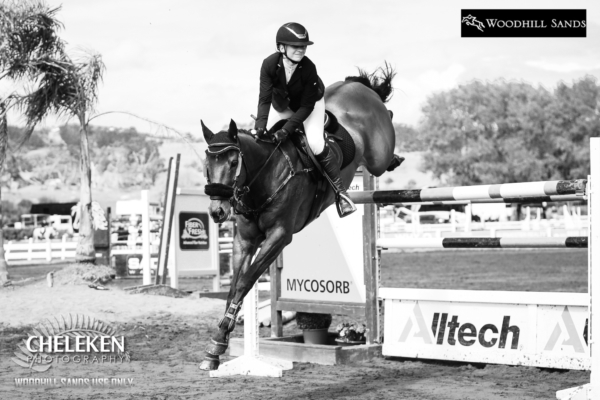 FMG Young Rider Series: Laura Inkster (Clevedon) Oporaes Jackamoe 1, Alyvia James (Cambridge) CoDicea 2, Nicola Hammond (Cambridge) Carlo I 3, Elmo Jackson (Auckland) Sugarman 4, Olivia Dalton (Karaka) Master of Hossack 5, Sharnaye Lammers (Hikurangi) Romeo NZPH 6. Dunstan HorseFeeds and Equifibre Junior Rider Series: Olivia Dalton (Karaka) Appleton 1, Ben Weir (Auckland) SF Gryphon 2, Jessica Collinson (Clevedon) Bunny Hop 3, Sarah West (Matamata) LC Talent 4, Emma Watson (Morrinsville) Maddox Kiwi Silverkee 5, Zara Lawton (Dairy Flat) SSS Bold Prinz 6. Hinterland Amateur Rider Series: Fleur Butler (Stratford) Amarula MVNZ 1, Belinda George (Warkworth) Pre Mo 2, Chanel Hargrave (Waiuku) Moving On 3, Shelley Bridgeman (Auckland) Midway Smooth Dude 4, Chloe Van den Boorn (Silverdale) Mirrabella Piper 5, Kristine Leonard (Whangarei) Annies Lane 6. Dunstan HorseFeeds and Equifibre Pro Amateur Rider Series: Christine Cornege (Cambridge) Varekai SL 1, Laura McGregor (Auckland) High Command 2, Sandra Stanford-Soons (Silverdale) El Vira 3, Alexa Randall (Auckland) Cirrius GNZ 4, Amanda Illston (Bombay) Verdelho 5, Tim Featherston (Kerikeri) Kiwi Supakee 6. ESNZ Alltech NZ Seven-Year-Old Series: Rachel Malcolm (Cambridge) Monte Carlo MVNZ 1, William Willis (Karaka) Cassera MS 2, Alyvia James (Cambridge) LC Taste of Diamonds 3, Rosie Commons (Auckland) Lotte 4. Mitavite Speedi-Beat Six-Year-Old Series: Oliver Croucher (Rotorua) Scotsmans Valley, Jeremy Whale (Cambridge) Dolce NZPH and Vicki Prendergast (Matamata) Selena C =1. East Coast Performance Horses Five-Year-Old Series: Tors Rattray (Mangatangi) Octavia MVNZ, Sam Matthews (Cambridge) Fleur DeLacour, Jaime Campbell (Cambridge) Casanova Xtreme and Brayden Aarts (Pukekawa) Camberley Phoenix AF =1. Burmester Realty Horse GP Super Series: Alyvia James (Cambridge) CoDicea 1, Paula Mussen (Pukekohe) KK Tane Mahuta 2, Rachel Malcolm (Cambridge) Henton Excalibur 3, Sam Matthews (Cambridge) Adloo Annabelle 4, Christine Cornege (Cambridge) Varekai SL 5, Sharnaye Lammers (Hikurangi) Romeo NZPH 6. Alltech NZ Pony GP Super Series: Emma Watson (Morrinsville) Galaxy Bonfire 1, Aoife Brennan (Cambridge) Galaxy Samurai 2, Summer Denize (Kerikeri) Limerick’s Black Samba 3, Madison Jackson (Pukekohe) Wilful 4, Liv Teixeira (Kerikeri) Spot The Difference 5, Lucas Bremner (Whangarei) Triple Star Curious George 6.